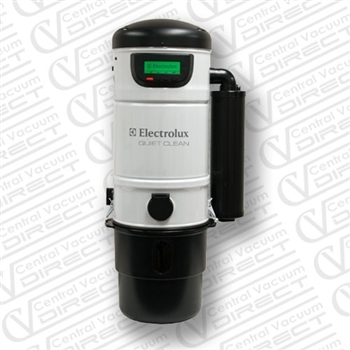 The Electrolux PU3650: this Electrolux central vacuum is a very high quality unit. Modeled after the best selling beam 375c, this central vacuum unit is designed to clean up to 7000 sq.ft. of living space. This does not necessarily hold true though, and with all central vacuums you should use the “rule of thumb” in the industry. This central vacuum rule of thumb is very simple. If you want your home to be adequately covered in terms of suction you should take the sq. footage of your home, double it, and then find a central vacuum model that is rated up to that amount. The reasoning behind this is logical, when these Electrolux central vacuum units are tested; they are done so in a factory. These are not real life settings. When a central vacuum is installed in a home it will have hundreds of feet of piping and then another 30-35 ft. of electrolux central vacuum hose. To account for this you use the “rule of thumb”, so for a central vacuum such as the PU3650 we would only recommend it be installed in homes ranging anywhere from 1200-4000 sq. ft. If your home is any larger than that you may be disappointed in the suction power of your Electrolux central vacuum. Electrolux PU3650 Durability: This unit has tested to be rather durable in long term use, which is what is most important to the consumer when thinking about investing in a central vacuum system. The gore-tex filter does a great job in protecting the motor from any dust and dirt that enters the central vacuum bag chamber. This eliminates the stress put on the central vacuum motor from this debris (other central vacuums such as vacuflo have dust travel through the motor and out of the exhaust). The warranty on these systems though seems to be a bit sub-par. The Electrolux PU3650 comes with a 7 year warranty on its electrical components. This may seem well and good to the average consumer, but it is no comparison to the 20 year warranty canavac offers on its XLS units. Overall PU3650 Electrolux Central Vacuum Review: This unit does have adequate suction and is a great model for homeowners, but in comparison to other brands such as canavac it may not stand up when comparing in price range. For the same amount of money (around $649.00) you can purchase a canavac unit that has a better commercial grade motor, higher suction rating, and a 20 year warranty. Electrolux PU3900 Central Vacuum Review: The Electrolux PU3900 central vacuum is larger than the pu3650, and also packs more of a punch in terms of suction power and cleaning capability. The Electrolux PU3900 is designed for homes up to 10,000 sq. ft. Just like the pu3650 though, you should apply the central vacuum rule of thumb and only install this unit into homes up to about 6000 sq. ft. If you follow this, you will not be disappointed in the suction power of the Electrolux central vacuum at all. This particular unit is very similar to the pu3650, but varies in a few important ways. The first major difference is in the motor itself. The PU3900 is a larger unit and designed for larger homes, therefore the suction motor installed on it is a lot stronger. One of the downfalls of this unit though (like all Electrolux central vacuums) is the warranty that comes with the product. Priced moderately at $745.00, this unit could have a better warranty. When you compare these central vacuum systems units you must cite “apples to apples”, and in an apples to apples comparison, the Electrolux unit just doesn’t stand up to its competition. Check out the canavac 911xls or canavac 511 xls (both available at centralvacuumdirect.com). With these central vacuum units you are able to get more for your money. They have a higher suction rating, and also come with a 20 year warranty on your electrical components (unheard of!). So whether you are looking for an Electrolux central vacuum specifically, or just shopping around for a power unit, always look at the specs and compare. 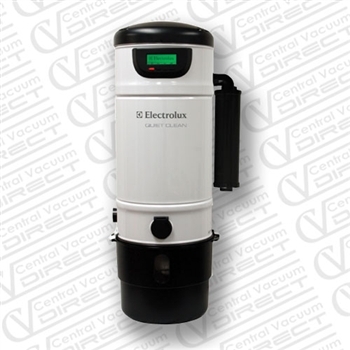 You can also check out electrolux central vacuum repair problems on our site. We walk you through all the different troubleshooting for your electroluc central vac. As of 2011, canavac has the best power unit available for the money and centralvacuumdirect.com has the best prices. This entry was posted in Electrolux Central Vacuum and tagged central vacuum, electrolux central vacuum, electrolux central vacuum reviews. Bookmark the permalink.